New scarf label Frankie Peach is, quite frankly, just peachy! Much like the fruit itself, the scarves are sweet, fresh and utterly modern. Founded by friends Sali Sasi and Charlotta Backlund, the duo boast impressive experience within the fashion industry— Sasi cofounded Stylerunner and Backlund has 10 years of styling experience, which recently included being fashion director of Cosmopolitan. It is this synergy that makes their scarves not only irresistible but clever and considered, as they offer everything from silk twillies and squares to generous cashmere pashminas. With a little help from our custom printing services, each scarf is patterned with beautiful folkish hand-painted wild flowers, Cocteau-esque figures, stripes, spots and big beautiful blooms that seem to go ‘Bang! Bang!’. You can’t help but note the succulent little peach that accents each scarf and their clever titles, including ‘Bare It All’ for the naked dames and ‘In Plain Sight’ for the simple cashmere wrap. Now we could stop there and let these delectable pieces speak for themselves, but how could we when they themselves speak for so much more? $1 from every Frankie Peach sale goes towards Pink Hope, a charity that empowers women to understand and reduce their risk of breast and ovarian cancer. What better reason is there to take a big juicy bite of this new label. Nell, Mother of the Dry Tree 2017, Synthetic polymer paint and mixed media on linen, wood. AC/DC, the Virgin Mary and Child — a collaboration? Why not! 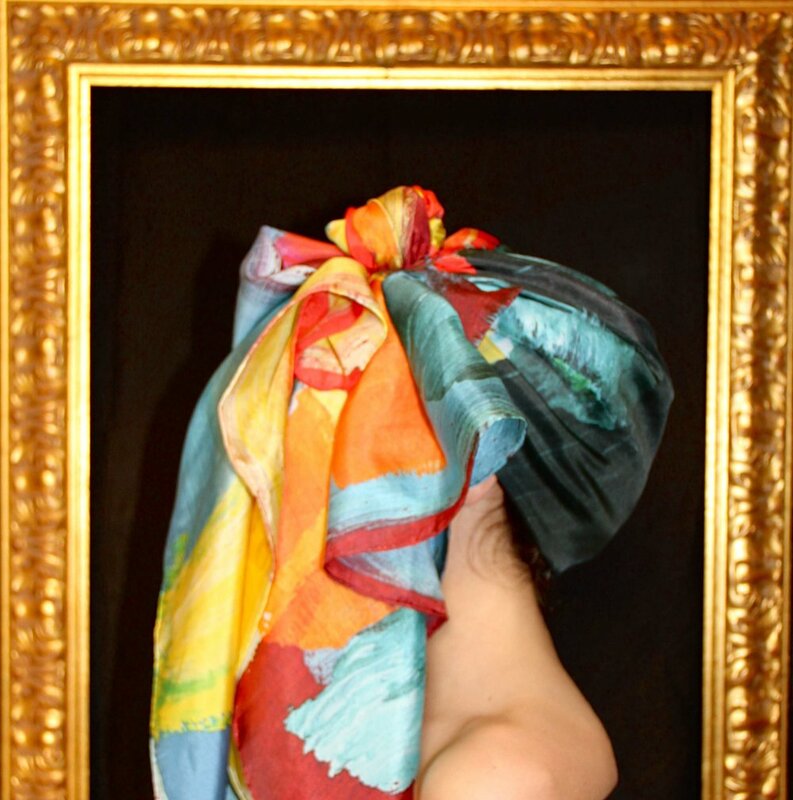 Here at Skarfe we continue to explore the fascination and utter joy of turning a significant piece of contemporary art into something that is uniquely wearable, and more importantly attainable! 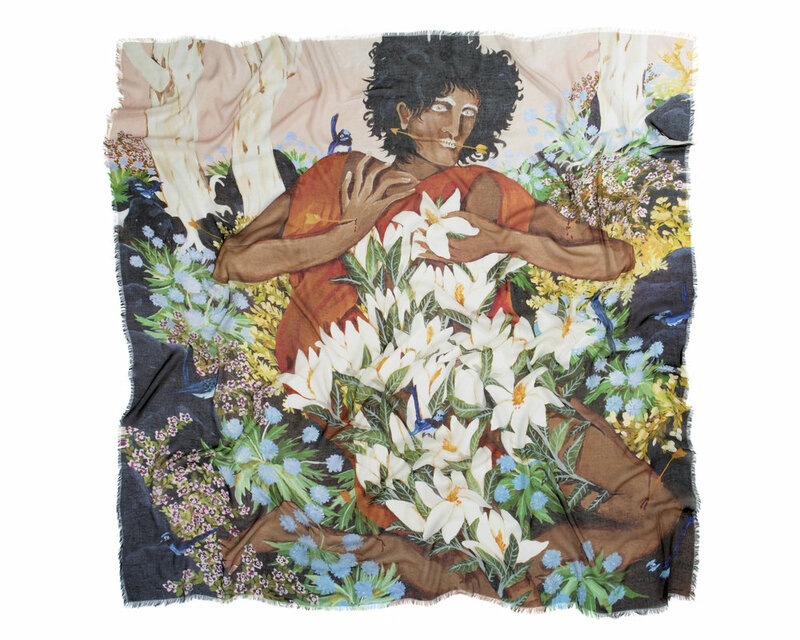 Imagine yourself swathed in the arm-like branches of artist, Nell’s ‘Mother of the Dry Tree’ painting, hung at Sydney’s Museum of Contemporary Art, as part of The National: 2017. Rendered upon a luxuriously soft and lightweight cashmere and modal blend, this oversized piece is both haunting and seductive. Fusing religious iconography with a rock ‘n’ roll aesthetic, our scarf exemplifies the way in which material and image combine to create its own distinctive art form. Nell’s work literally speaks for itself- with its wailing ovoid shapes that could possibly be singing a rendition of ‘Highway to Hell’. Now isn’t that an interesting thought?! Nell is represented by Roslyn Oxley9. Shop the limited edition Nell collaboration here. Our 3 day 30% off Boxing Day Sale is on now! Use discount code THIRTYOFF at checkout until Midnight Wednesday AEST, to receive 30% off all purchases, and free global shipping! Or visit our new Hughes Street store, open 11am to 4pm between Christmas and New Years. Happy holidays and happy shopping! We're super excited to introduce VYF's second season of scarves, Jungle Boogie. VYF is a young emerging design team hailing from Budapest, Hungary. Their highly stylised, almost kitsch artworks combine elements of paper cutouts, illustration and photography. 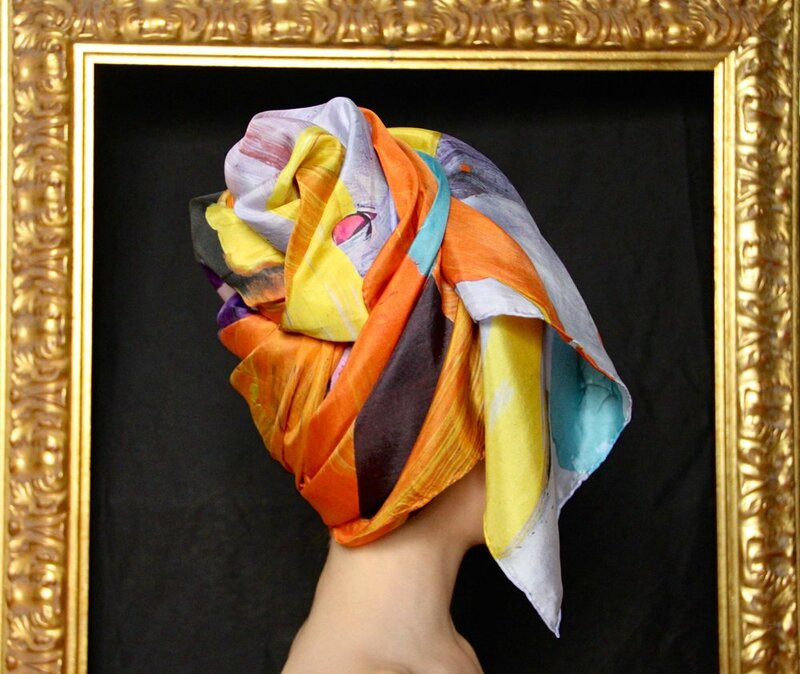 The works are then digitally printed to a soft silk cotton blend, and finished with bold silk satin trims. Jungle Boogie features motifs of summery, suburban sprawl, in retro, Hockney-esque colourways. And if you've been on the hunt for smaller-styles of scarves, the range also includes bandanas! Shop the collection now. As you may have heard, Skarfe has just moved around the corner to a new location at 8A Hughes Street, Potts Point! We'd like to warmly welcome you to our new store, and to celebrate, we are hosting a Welcome & Christmas Drinks evening on Tuesday December 13th from 6pm. As the festive season kicks off, come and peruse our luxury scarf lines which make excellent gifts for family and friends. With a choice of designer new arrivals and Skarfe's classic cashmere range, you won't want to miss the opportunity to select a stunning scarf (or two) for your loved ones this Christmas! We look forward to embarking on this new chapter with you all! Berlin-based Front Row Society continues their unique work with international artists for the new season collection, Silent Contours. Marking a departure from somewhat softer motifs of seasons past, the Silent Contours design challenge asked Front Row's artists to seek inspiration in industrial structures; the linear details, geometric elements, and the shadows they cast. The outstanding results can be seen in the current collection of oversized 100% cashmere scarves, available in store and online now. Shop the collection here, and enjoy your own piece of wearable art!